Boys have their funny bone, too! 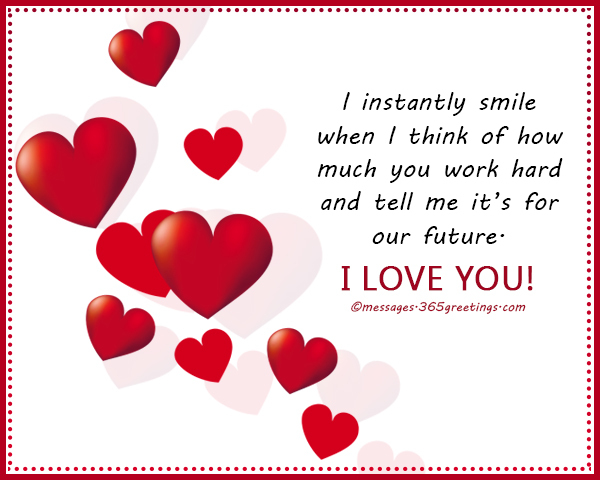 Tickle their emotions with these Love Messages for Boyfriend that will make them love you more! 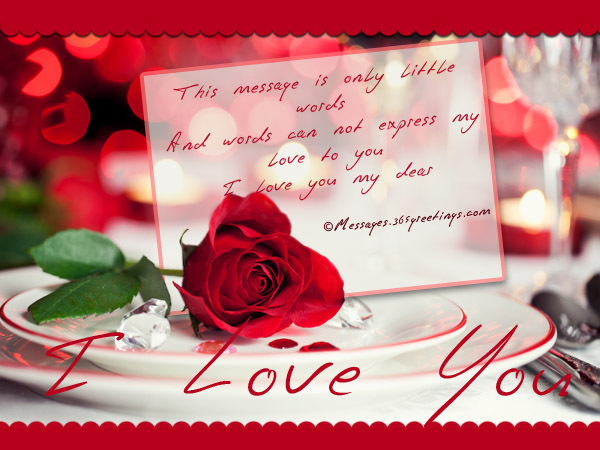 You can also write these love wordings in your Valentine’s Day cards and love cards. 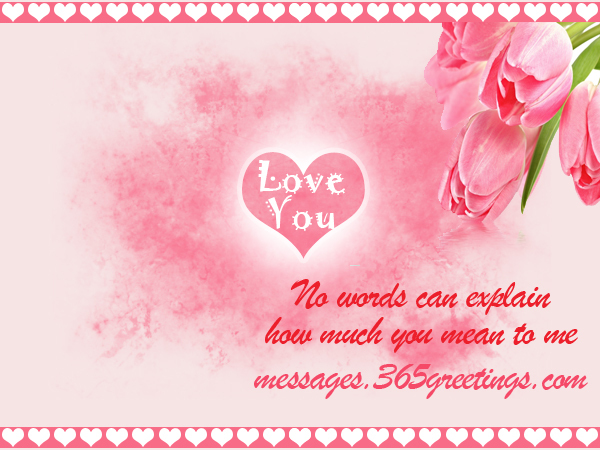 Make them feel your love by sending these as love SMS messages or love text messages. having a walk on the sands of beach – the most embarrassing moment in my whole life! Stay with me forever honey! You are my dream come true lover. So you are very special in my life and I treasure you so much! I am happy to be loved rather than you are being loved by me! You always stand on the top in whatever you do to love me! I feel so proud and happy to have you dear! Do you want to know the most embarrassing moment in my life – the moment when you held my cheeks on your hands and kissed my forehead and said “I love you” – nothing I need in this whole world except you! You are there to guide me, encourage me, and comfort me – so I don’t need to worry about my life! I have surrendered my whole life to you! You take care of me my dear! I can split my life into two halves – one is before I met you and another one is after I met you. 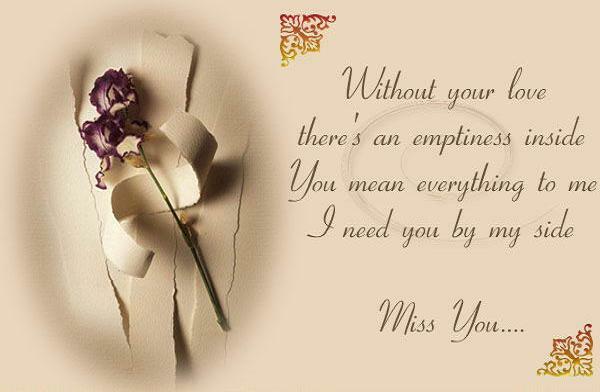 The life before I met you is with emptiness and the life after I met you is fulfilled! You are the reason for it honey! You made me a whole being – without you this is impossible! I love to hear your voice. It makes me feel that you are near me. When you hold my hands I feel that I am truly yours. If I am passive sometimes, I am sorry. I just do not know how to be sweet to you. Can you teach me? Every day with you is Valentine. I do not have to wait for Feb.14 just to let you feel special. You are the reason why I am glowing with happiness. Life is happy with someone as loving as you! You always make me feel beautiful. I love you because God gave you to me. You are like a vitamin that removes my stress and makes me energetic. 24 hours is not enough when we are together. I want to be with you longer. I love it when I make you smile. Your presence is enough to rock my world. You are mine, and I am yours. I love you, I love you! 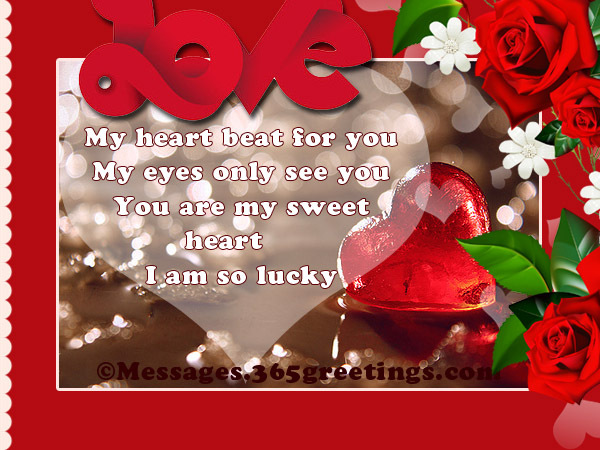 Here are some samples of love messages for him that you can use for your cards or as love text messages. 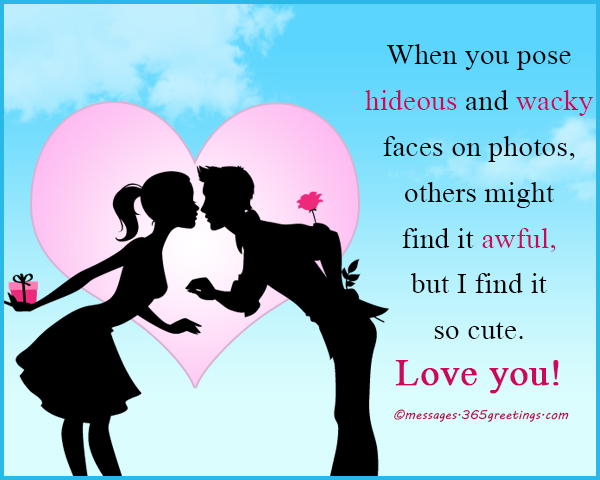 Feel free to post these messages of love for your boyfriend, husband or special someone on their facebook walls or twitter profiles. I love you for letting me use your sweater whenever I feel cold. But hugging me would do. into a gleeful feeling of love when you’re there to catch me. no pretentions, no lies, just you. I love you. you’ll sit next to me and talk with me? You always lighten up my burdens. I consider your shoulder as my sanctuary. No harm can touch me when I lean on there. Thank you for serving as my thoughtful guide when I feel deeply lost. Your friends must be so proud of you! I instantly smile when I think of how much you work hard and tell me it’s for our future. You’re the firm wall that hinders all the hazards that might attack me. You are such a strong and brave man, that’s why I love you. you are the man I am going to spend my life with. others might find it awful, but I find it so cute. You talk to me like we are best friends. We quarrel like a husband and wife. We play silly games like kids, and you protect me like I am your sibling. Could this relationship get any better? I want to stay this way forever. 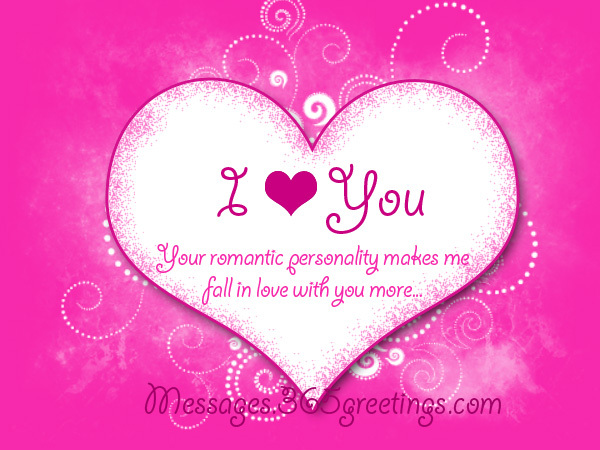 Looking for romantic love text messages for him? Look no more. 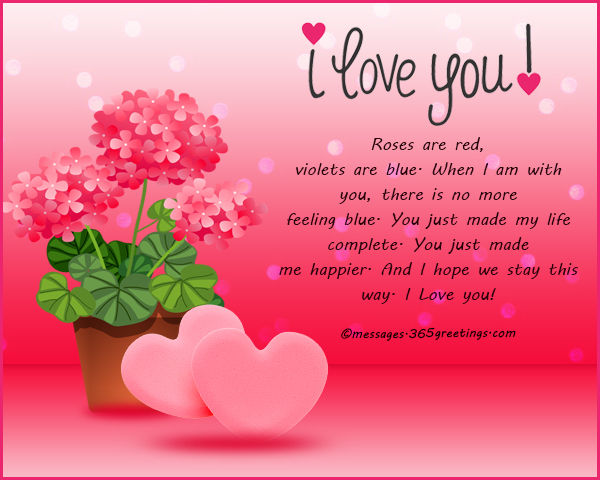 Here we provide some of the sweet and most inspirational love messages for husband, for boyfriend or for special someone. 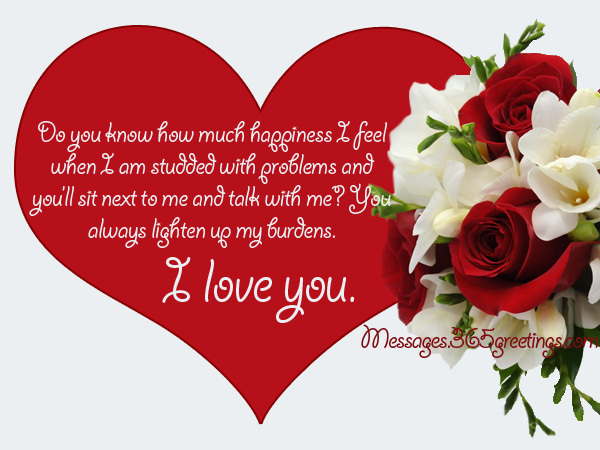 These love SMs messages for him are packed with lovely wordings that will surely make him love you more, or notice you if he still doesn’t. Even if I’m the wrong one and never admitted it, you’re still the one offering your apology. Thanks. Love you! I love it that you show to other people that you are confident to have me. I love you! You are my shelter that keeps me safe from the storm. That’s how much I need you. I love you! You are the only guy who left me wandering with my mouth open. You’re that astonishing! I love you! Cupid must be so wise for shooting me with his arrow while looking at your gorgeous and handsome face. I love you! You are the healthy food when I am already starving to death. You are that important to me. I love you! You are like the scented blow of air that I breathe, because I’ll be lifeless if you’ll be gone. Don’t leave me. I know you won’t. I love you! You like an umbrella: you are always there to protect me, rain or shine. I love you! I am not a perfect and not the most beautiful girl. But your love just made feel complete, perfect and beautiful. Thank you. I always feel wonderful when I am with you. I wish to be holding hands with you always and face tomorrow together. I Love you. Roses are red, violets are blue. When I am with you, there is no more feeling blue. You just made my life complete. You just made me happier. And I hope we stay this way. I Love you! 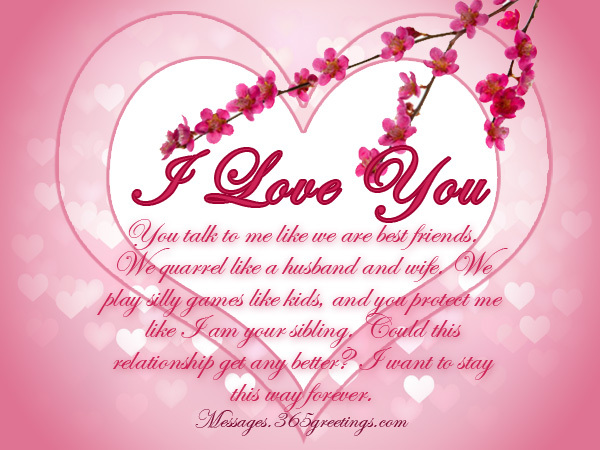 If you want to make your boyfriend feel elevated with love feel and melt for you here comes our romantic messages for boyfriend section. Thinking about someone at all times with no reason – remembering them even when we are busy is true love and affection to show such affection and love we use to send messages. Each and every word picked out from this section is going to help you to build a romantic relationship with your lovable boyfriend. Below find those romantic messages for boyfriend. do you know what that is? It’s YOU my dear. I feel so excited and happy to get you in my life. I just want to say that you mean so much to me! – now I am a flower with value after I met you. You are my garden and I want to decorate your life! We just stay the way we are and want to be the best lovers among the people around us. but for the reason they gave me a chance to meet you and become part of your life! I love you my honey, love you so much! You are the superman of my life – you lift me to the heights to reach the sky and touch the stars and moon! 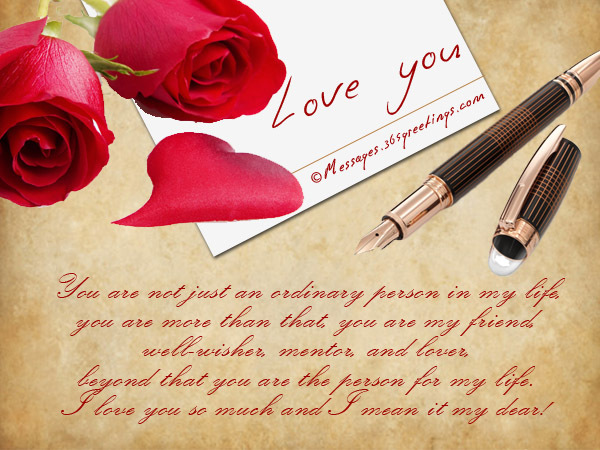 You are so special my dear – I love you! I don’t find enough time to think about you my honey! I run short of time J if you can please lend me some time, I would be so grateful to you! Even my eyes and mind fighting with me to rest because they don’t like me to stay away from thinking about you! I love you my sweet heart! my breath can stop only for you! You are my soul deep rooted into my heart! Love for you will always remain in my heart. Being in your arms is the best ornament. with your thoughts ruling over my mind. I feel I am beautiful. I feel I am alive. That beats only for you. If you were born as a bee?? I would have born as a flower. I wish the journey to start forever and end at never. if I miss these I am going to miss my life. the only answer from me for these many question is I LOVE YOU. I take my breath to survive. You are the reason for my survival. beyond that you are the person for my life. 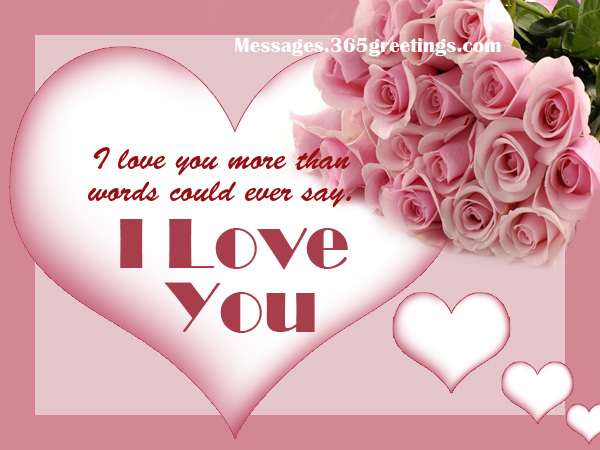 I love you so much and I mean it my dear! you are the best thing given to me by God. I love you so much and I admire you my honey! how I met you in my life. The turning point in my life is meeting you. you make everything so easy for me to run my days. I would like you to be with me forever. took your shoulders for my support. I feel so comfortable with you dear. I feel so embarrassed with the way you love me.